When the thrill of the racetrack meets the thrill of kaleidoscopic gemstones. 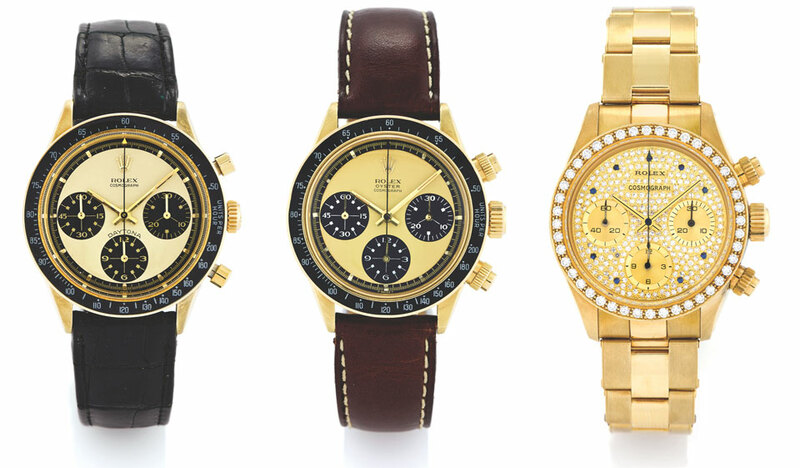 What happens when the iconic Daytona runs into a tutti-frutti trove of precious gemstones? 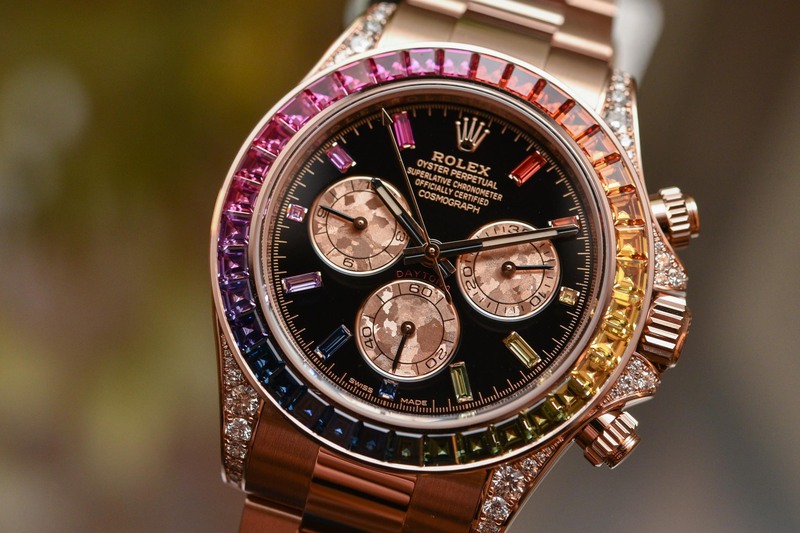 The Rainbow Daytona: a spectacular watch that combines the thrill of the racetrack with the thrill of vibrant gemstones. 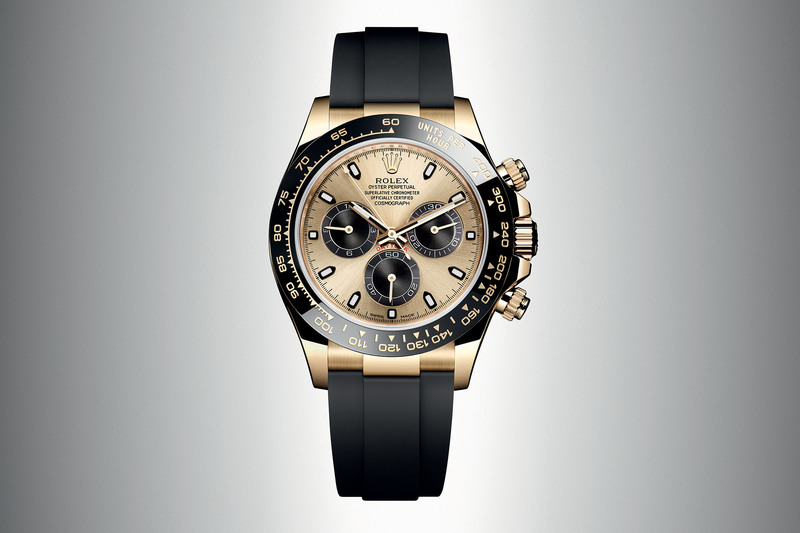 The Rolex Cosmograph Daytona Ref. 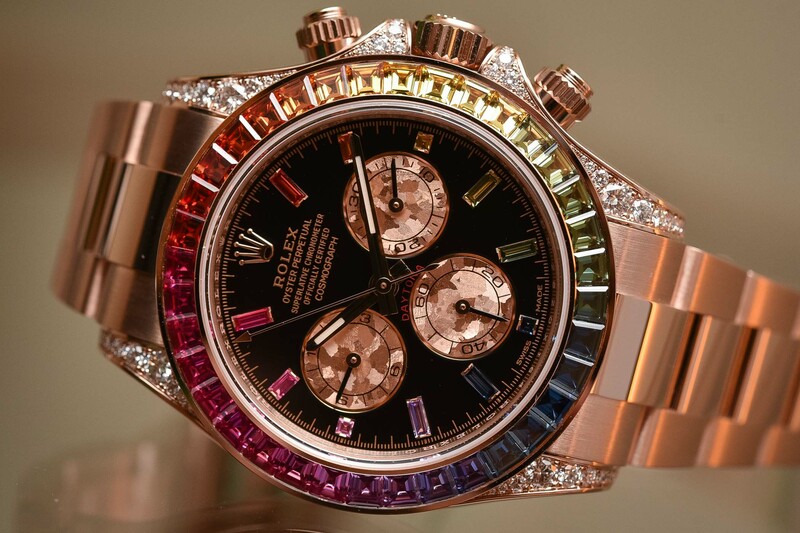 116595RBOW, aka the Rainbow Daytona, is a “wow watch”. Exuberant and downright flamboyant, it’s either yes or no, love or hate, but you can’t help reacting to it. Now in its third iteration, the model unveiled at Baselworld 2018 comes in a warm Everose gold case and the hour markers are highlighted in gradated sapphires to match those set on the bezel. 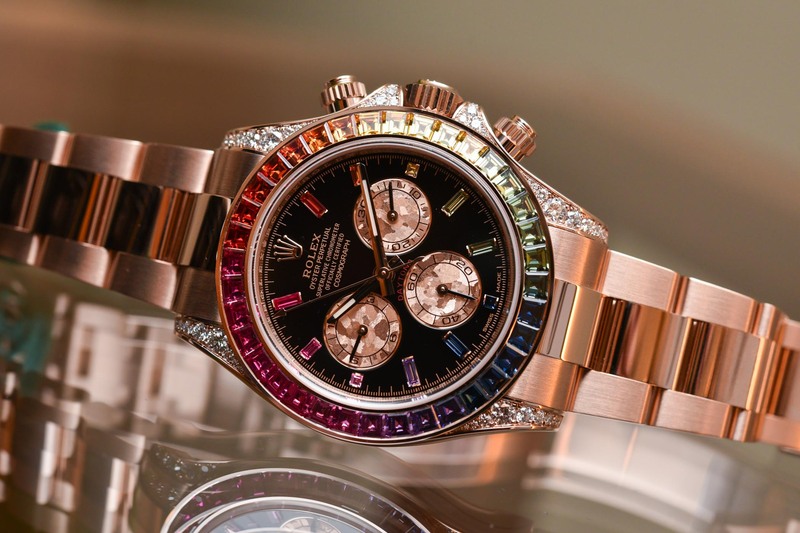 Warmer and more harmonious than its white and yellow gold predecessors, the 2018 Cosmograph Daytona recreates the colours of the rainbow with extraordinary beauty and showcases the superlative skills of Rolex’ gemmologists and gem-setters. The idea of taking a hallowed Cosmograph Daytona – a legendary watch associated with motorsports events since its debut in 1963 – and replacing its tachymetric scale with multi-coloured sapphires and decorating its case with diamonds was audacious, to say the least. Wouldn’t this alienate legions of Daytona fans who associate the watch with men like Paul Newman – whose Daytona recently fetched a whopping $17.7m at auction? It might well have offended some Daytona purists, but for a handful of folks out there, the jewellery Daytona was the proverbial pot of gold at the end of the rainbow. 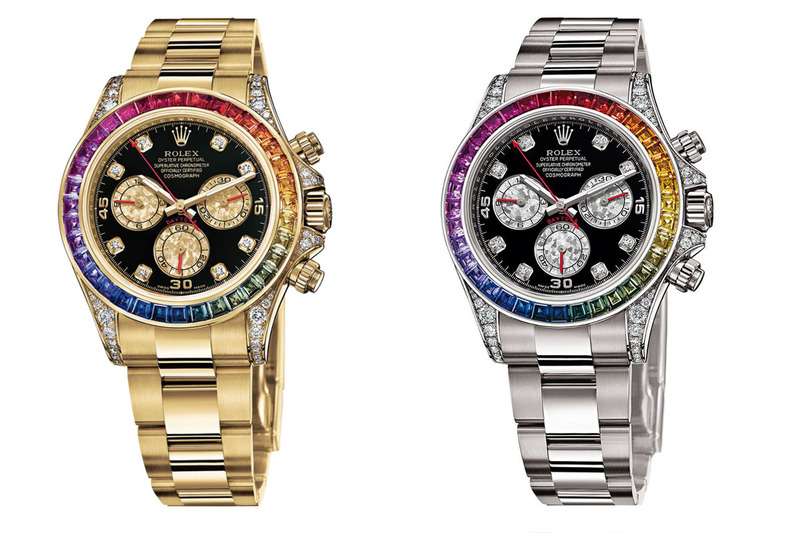 First released in 2012 in white and yellow gold, the Rainbow Daytona garnered an almost immediate cult status and hot demand meant that its value was promptly duplicated on the secondary market – these 116598RBOW (yellow gold) and 116599RBOW (white gold) Daytona Rainbow currently sell for around CHF 160,000 to CHF 200,000. Limiting production is one way that watch brands like Rolex spark demand – think back to the stainless steel Daytona and its interminable waiting lists – but there is another way of fuelling demand, courtesy of Mother Nature. 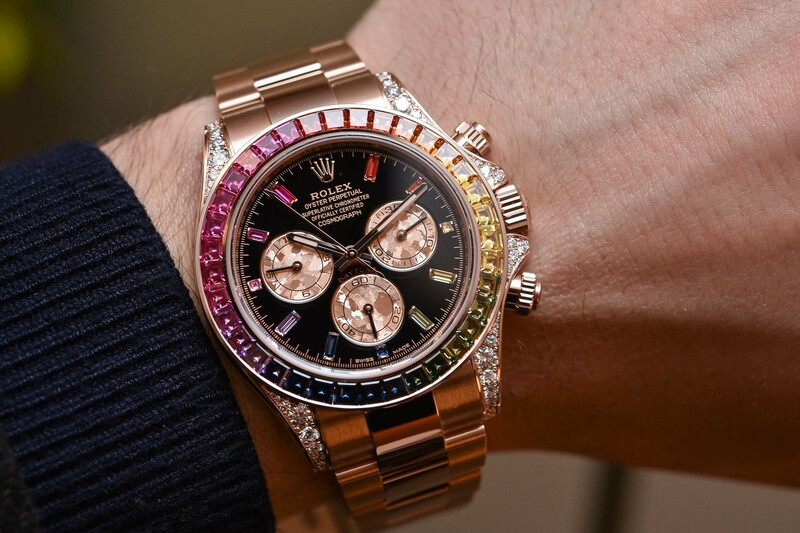 According to a spokesperson at Rolex, the limitation of Rainbow Daytonas is determined by the fact that it is extremely difficult to source coloured sapphire stones that match one another exactly. And while we’re on the subject of limitations, it was made patently clear that this watch plays it both ways and appeals to men and women alike. 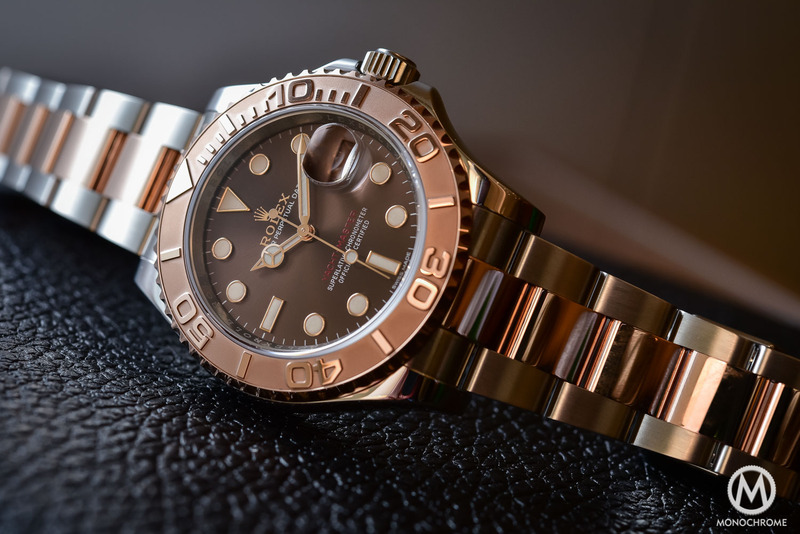 Although we tend to associate with Rolex with professional, sports-oriented watches, Rolex has always had gem-set watches in its portfolio – actually, a lot of them. And in the same quality-driven spirit that characterizes the company, Rolex has its own in-house team of gemologists and gem-setters. Nothing escapes the beady eyes of these experts and only top quality stones make the cut. 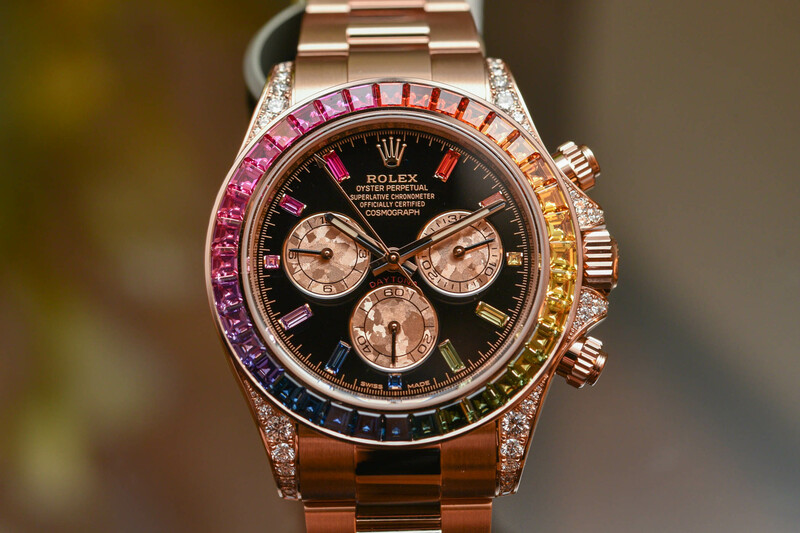 Having recovered from the initial impact of this Rolex Daytona Rainbow Everose Gold 116595RBOW, a closer look at the stones reveals the subtle colour gradation of the 36 baguette-cut sapphires on the bezel as they transit seamlessly through the colours of the rainbow. Using the technique of channel setting, the gem-setters arrange the stones flush with one another in a groove or channel sculpted in Everose gold, the edges of which are folded over to secure the stone. Since there are no prongs around the stones, the colour of each individual sapphire is exalted. In a departure from the earlier Rainbow Daytona models with diamond hour markers, this new reference 116595RBOW features 11 baguette-cut sapphires on the dial, perfectly matched in saturation and intensity to the corresponding stone on the bezel. The combination of the coloured gemstones against the black lacquered dial is very pleasant indeed and, in my opinion, more harmonious than the former diamond markers. The three sub-dials are also crafted in a proprietary Rolex gold – known as Gold Crystals – and have a mottled texture that looks almost like a sliver of meteorite. And the effect, as you can appreciate, is extraordinary. So extraordinary that it is easy to miss the spray of 56 brilliant-cut diamonds, of different sizes, set into the lugs and crown guards. 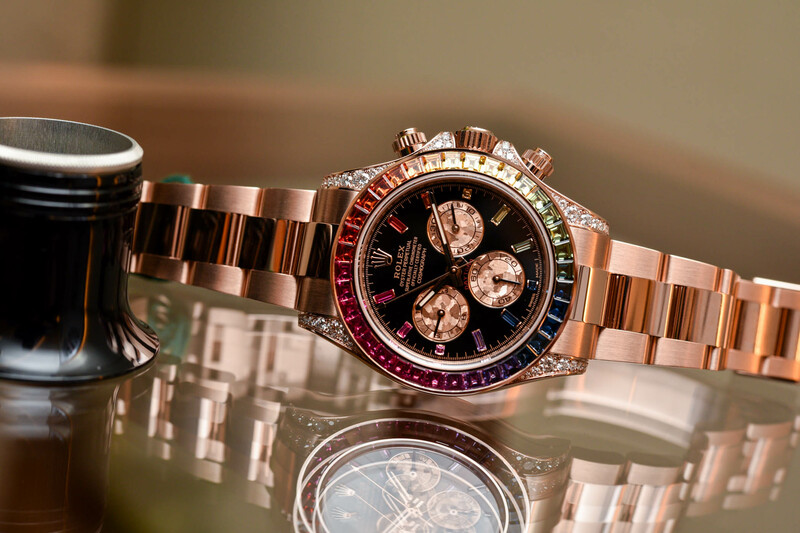 With so many precious rocks on the case, it is reassuring to know that this Rolex Daytona Rainbow Everose Gold 116595RBOW is protected in an Oyster case, a champion of robustness and reliability. The message is that this watch is not a trophy to be guarded in a safe, but a bona fide Rolex Daytona that is built to last and to be worn with pride. The screwed-down case back, the screwed chronograph pushers and the Triplock winding crown ensure water-resistance to 100 metres, while the crystal protecting the dial is virtually scratchproof. Another practical consideration is the application of blue Chromalight on the pink gold hour and minute hands allowing you to consult the watch in poor light conditions. Housed in the signature 40mm Daytona case crafted from a solid block of Rolex’ proprietary 18k Everose gold, the beauty of Everose gold is its ability to weather time with exceptional elegance, keeping its warm rosy lustre intact even after being exposed to the elements and chlorine. Inside the case is Rolex’ sturdy calibre 4130, an automatic column-wheel chronograph movement with vertical clutch for precision starts and stops. Equipped with a Perpetual rotor, the watch offers a power reserve of 72 hours. The blue Parachrom hairspring is insensitive to magnetic fields and offers great stability in the face of temperature variations and shocks. 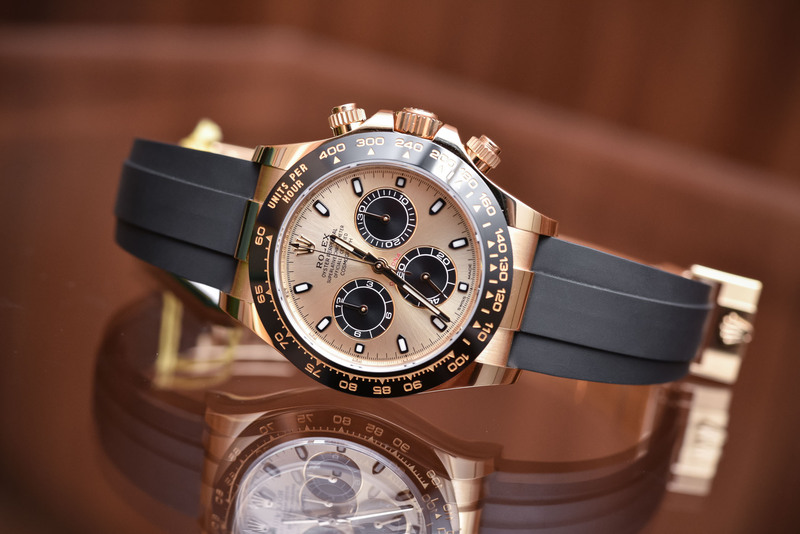 Like all Rolex watches since 2016, the Cosmograph Daytona complies with the stringent Superlative Chronometer certification developed by Rolex with precision rates of -2/+2 seconds per day, more than twice that required of an official chronometer (it is also COSC-certified). A solid three-link 18k Everose bracelet accompanies this flamboyant 116595RBOW and is enforced with ceramic inserts and a lifesaving Oysterlock safety clasp to prevent accidental opening. You’d be surprised how much this weighs on the wrist! 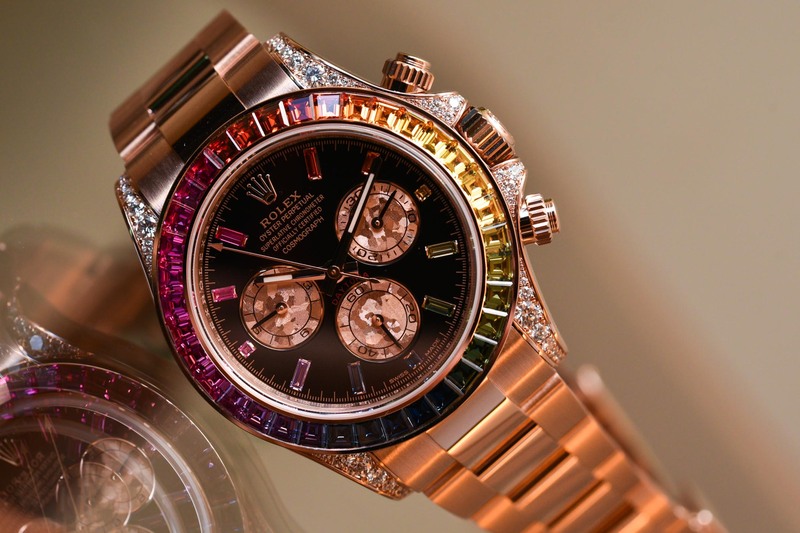 Although Rolex will never disclose the amount of Cosmograph Daytonas produced, and the chances of you getting your hands on one will be as elusive as chasing rainbows, the price is CHF 92,400. 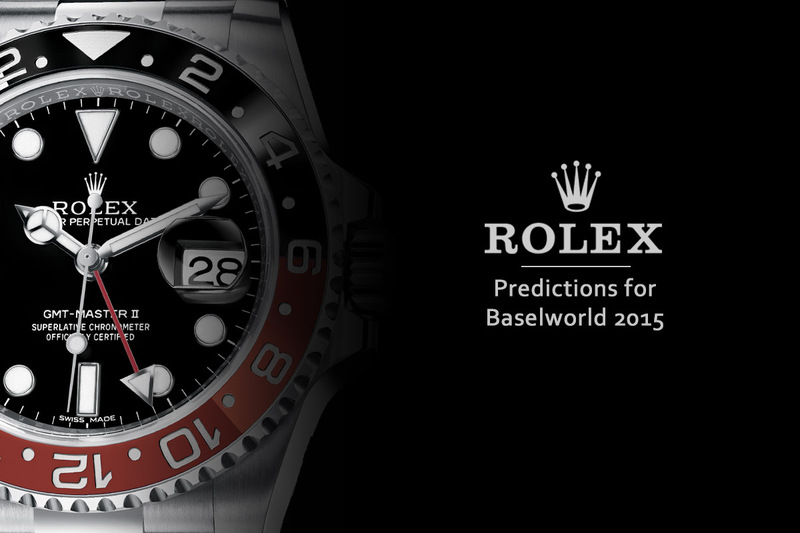 Please consult www.rolex.com for further details. The power reserve is impressive.